Of course, when a festival knocks your door, you feel rather happy than your typical days. I’m not different from you. But I’d rather miss the month of Ramadan although ahead is the largest religious festival of Muslims, Eid-ul-Fitr. 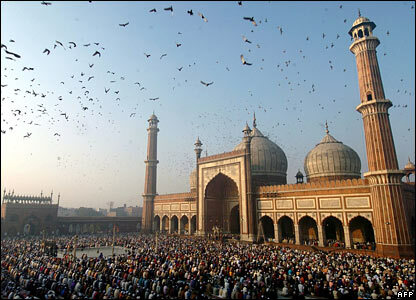 Such gathering is seen on the Eid day prayer in the early morning. I always enjoy the second half of the Ramadan as a breeze of joy blows all over the country. It’s like you go out of your home. Look at the people around and you feel the festival ahead. I miss that scene very much after the Eid. You see people rush between home and supermarkets to buy new dress, shoes, etc as a preparation to celebrate the largest festival. You feel that the entire country is preparing for a joyous occasion. This scene, to me, is more pleasant than the Eid day. Anyway, I’m not writing this post with a detailed feeling of mine. In fact, I wish I could. But I won’t waste your time; not now. I’m just hoping that everyone may have a very happy and pleasant Eid with their relatives, family and friends. Next Have you put me on your reading list? Thank you very much, Hesham. Never thought you’d be commenting on this blog. 🙂 It went to spam filter, for some strange reason. Eid Mubarak to you too. 🙂 Hope you visit my site regularly. 🙂 Did not know you had an English blog over there. Very Nice, but now people like me and you gonna miss those busy nights of Ramadans, wish you have many Ramadans in your life. Thanks for your comment. Eid Mubarak to you too. Eid Mubarak for you, Sajib. I know that feeling about missing Ramadan. By the way, thanks for visiting my blog! Eid Mubarak to you too. Thanks for being on my blog. Hope you come back.